Episode 19 of the Date Night with Jake and Page podcast is here. And, oh snap, do we have a special one for you – we had Muggsy and Kim Bogues join us in studio! Muggsy Bogues is, well, let’s not mince words – he’s a Charlotte sports icon. Point guard for those classic, throwback Hornets teams, Muggsy made a name for himself not only in the QC, but on the big screen as well, starring alongside Michael Jordan (and fellow Hornet Larry Johnson!) in Space Jam. Our kids (and Jake) may or may not have seen Space Jam 2,873 times. He and Kim KEEP. IT. REAL. over the course of our hour together. Their relationship backstory is interesting to say the least, with Muggsy even stopping himself at once point and admitting that he had never told part of their story publicly before (which Kim acknowledged hilariously). 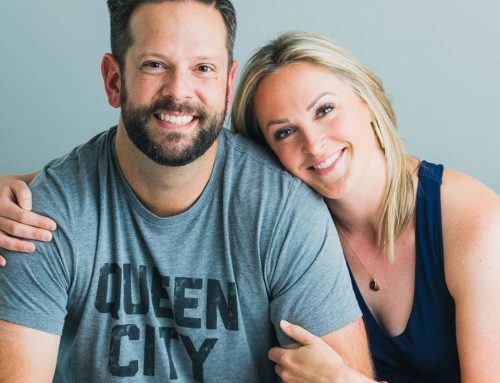 We also talked post-NBA life, what they’re up to now, and how Kim is trying to keep up with the crazy success of her catering business, Hearth-N-Soul. We can’t thank Muggsy and Kim enough for joining us on this episode, and as always, big thanks to Garrett Tichy, Hygge and Richard Brooke for having us as a member of their inaugural Hygge Podcast Residency! Please subscribe, share and comment on this episode. Past shows can be found on jakeandpage.com, iTunes and wherever you get your podcasts. We live stream most episodes on Facebook (Page Crawford Fox 46) and videos are posted to youtube.com/jakefehling.